Lennon, Rodgers, Allardyce, Wenger and Carsley. MARTIN O’NEILL and Roy Keane were relieved of their duties on Wednesday morning following a dismal 2018 which saw Ireland secure one win in nine games and fail to score in four successive matches, stretching over six and a half hours of play. The news means the FAI have a big job on their hands to appoint a suitable successor who will try and get Ireland back on track as Euro 2020 qualifiers loom on the horizon in March of next year. Bookies have former Ireland boss Mick McCarthy and current Dundalk manager Stephen Kenny as the leading candidates at the moment, however there is currently no one outstanding candidate to take over, causing much speculation as to who O’Neill’s successor might be. The Derry native enjoyed a number of highs in charge of the national team, leading his side to the knockout stages of the European Championships in 2016 and also to a World Cup play-off 12 months ago. However a poor calendar year which saw Ireland relegated to League C in the Uefa Nations League has forced the FAI to make a change, with the 66-year-old’s successor facing a tough task to try and reinvigorate a national side at a dangerously low ebb. Rodgers would be an aspirational, but unlikely, appointment having enjoyed success at both Liverpool and Celtic in recent years. Having began his coaching career at Stamford Bridge, the Antrim native turned heads with an attractive, passing style of play at Swansea before taking the hot-seat on Merseyside. He almost led Liverpool to the Premier League title in 2013/14, but since his Anfield departure has led Celtic to back-to-back trebles in the Scottish Premiership. The 45-year-old’s side struggled at the beginning of this season, but have reclaimed top spot in the SPL in recent weeks. With a secure position at Parkhead, Rodgers is incredibly unlikely to take over as Ireland manager. His CV makes him an outstanding candidate for the position, but timing does not appear to favour either party as he attempts to lead Celtic to an eighth consecutive title between now and the end of the season. Currently out of a job, Wenger does not share the same problem as Rodgers when it comes to availability. Another ambitious (but expensive) candidate for the FAI, Wenger represents a proven, successful and iconic manager who has helped to define modern football while in charge of Arsenal. The Frenchman led the Gunners to three Premier League titles and seven FA Cups, winning a Ligue 1 title with Monaco before making the move to England as an unknown entity in 1996. His final years in charge in London were a marked, stale contrast to the dynamic and revolutionary football which made him so successful during his first decade in charge. Wenger was let go of his position at the end of last season, his side failing to win Premier League title in 14 years, with three FA Cups in his final four campaigns in charge restoring a semblance of pride to an otherwise frustrating final interlude. Likened to the appointment of Giovanni Trapattoni in 2007, Wenger would be a costly hiring, but one which would be guaranteed to reignite interest in the national side following a dull end to the year which saw just 31,000 fans attend last week’s friendly with Northern Ireland. A man who knows the lay of the land in Ireland having gotten his coaching chops while in charge of Limerick FC in the League of Ireland during the early 1990s, Sam Allardyce represents a steady pair of hands in many people’s eyes. The much-maligned manager has faced consistent criticism throughout his career for a conservative style of play while in charge of Sunderland, Crystal Palace and Everton in recent years. He undertook an infamous 67-day tenure in charge of England in 2016, but has been out of management since departing Goodison Park back in May having led Everton to eighth place. Big Sam has a proven track record as a Premier League boss and is a very viable candidate to take over at Landsdowne Road. A major roadblock, however, would be a style of play which fails to attract big crowds to the Aviva Stadium. Recent reports suggest the FAI were alarmed by recent low attendances at home games in Dublin, meaning the need to appoint a new manager who will re-introduce a sense of excitement and buzz about the national team is a major priority. A former Ireland midfielder who earned 40 caps for his country before retiring from international football in 2008, Carsley has been hailed as one of the most promising coaches in English football in recent years. Since hanging up his boots seven years ago, Carsley has enjoyed extensive coaching experience at all of Coventry City, Sheffield United, Brentford, Manchester City and Birmingham. The 44-year-old obtained his coaching badges as his playing career came to a close while at Everton and immediately took his first coaching position straight after retirement — firstly as Coventry’s U18 manager and then as Sheffield United assistant boss in the summer of 2013. He was sacked alongside manager David Weir in October 2013, but soon after enjoyed extensive experience in the England underage set-up, being appointed as be a full-time “out of possession” coach for all the England sides between U15 and U21 level. In August 2016, Carsley was hired as Manchester City’s U18 manager, where he led the Blues to an FA Youth Cup final and to the top of the North Division in the Professional U18 Development League. In-between Coventry, Birmingham and England, he also spent time as Development Squad manager for Brentford, most recently returning to Birmingham as Head Professional Development Coach; a position he held until March 2018 when he left alongside senior boss Steve Cotterill. Carsley has been highlighted as a candidate to take over from Noel King as Ireland’s U21 manager, but with coaching experience in some of the highest jobs in English football, his extensive coaching CV put together in such a short space of time makes him an outside, but intriguing, candidate for the senior job. Similar to Brendan Rodgers, Lennon is also currently employed in Scottish football and as a result is unlikely to be a leading contender to take over from his former manager at Celtic Martin O’Neill. Lennon has made the transition from playing to management rather seamlessly. Taking over at Parkhead in 2010, he led the Hoops to three consecutive Scottish league titles, two Scottish Cups and also secured a memorable Champions League victory over Barcelona. After Celtic, the 47-year-old undertook a two-year spell in charge of Bolton, where he successfully navigated a relegation battle in his first season in charge before being dismissed in March 2016 with the club bottom of the Championship. The Lurgan native has found success again back in Scotland, leading Hibernian to the Scottish Championship and promotion back to the top-flight, extending his contract in September 2017 by a further three years. That new deal makes Lennon an outside candidate, but with success in both tiers of Scottish football, time spent in charge in the Championship where many current Ireland internationals ply their trade and links with Ireland by way of punditry duties with TV3 and Virgin Sport, his name is — at the very least — being mentioned for the top job. Email “Wenger, Big Sam and Rodgers: 5 outside candidates to take over as Ireland manager”. 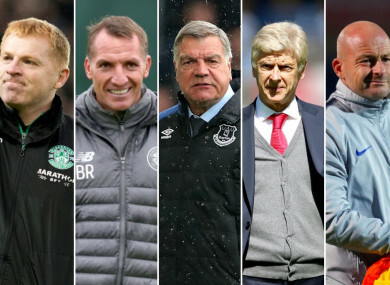 Feedback on “Wenger, Big Sam and Rodgers: 5 outside candidates to take over as Ireland manager”.